Some 300 species of amphibians inhabit North America. The past two decades have seen an enormous growth in interest about amphibians and an increased intensity of scientific research into their fascinating biology and continent-wide distribution. 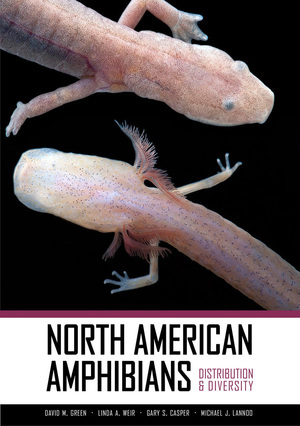 This atlas presents the spectacular diversity of North American amphibians in a geographic context. It covers all formally recognized amphibian species found in the United States and Canada, many of which are endangered or threatened with extinction. Illustrated with maps and photos, the species accounts provide current information about distribution, habitat, and conservation. Researchers, professional herpetologists, and anyone intrigued by amphibians will value North American Amphibians as a guide and reference. David M. Green is Professor and Director of the Redpath Museum at McGill University in Montreal, Quebec, Canada. Linda A. Weir is Wildlife Biologist with the US Geological Survey and Coordinator of the North American Amphibian Monitoring Program (NAAMP) at the Patuxent Wildlife Research Center in Maryland. Gary S. Casper is Associate Scientist at the University of Wisconsin-Milwaukee Field Station and head of the Wisconsin Herpetological Atlas Project. Michael J. Lannoo is Professor of Anatomy and Cell Biology at the Indiana University School of Medicine. He is the author of Leopold’s Shack and Rickett’s Lab and Amphibian Declines (both from UC Press), among other books.